The alcohol found in alcoholic beverages is ethyl alcohol, the only alcohol which is produced by fermenting fruits and grains. Fermenting is a chemical process whereby yeast converts the sugars present in ingredients into alcohol. Just like other depressants, alcohol slows down vital functions and can result in unsteady movement; slurred speech; distorted perceptions, and delayed reaction time. Observing the effects that alcohol has on a person’s mind, it’s’ best understood as a drug which while reducing a person’s rational thinking powers, also distorts his/her judgment. Most people drink it for stimulating effect like loosening up, but if consumed more than a person’s capacity, then depressant effect of alcohol kicks in. People who experience this effect start losing control and coordination over oneself. 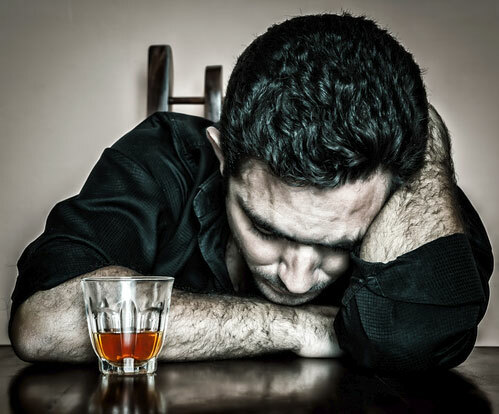 Overdosing alcohol can result in even more severe depressant effects such as toxicity; inability to experience pain; fainting; as well as dangerous and lethal complications like coma or death. These depend on the amount of alcohol imbibed and the rate at which it has been imbibed. Alcohol is absorbed into the bloodstream through small blood vessels present in the walls of the small intestine and stomach. The time taken to travel from the stomach to the brain is usually in a few minutes, at which point effects start kicking in. It starts slowing the nerve cells’ action and generates a sense of disorganization. Typically, 20% of imbibed alcohol is absorbed through stomach with the rest being taken in through small intestine. Bloodstreams transports alcohol to liver where it is eliminated from the blood through metabolizing. The capacity of liver to metabolize alcohol is limited, leaving the excess to circulate in the body. Suffice to say, intensity of alcohol’s effect on body is proportionate to the amount ingested. When alcohol level in bloodstream exceeds a certain level, the respiratory function slows down dramatically and can even result in coma or death, since brain becomes deprived of oxygen. Each person reacts differently to alcohol consumption and if we compare a youngster to an adult, it would be different for both. Ability to tolerate alcohol effects in a youngster is compared to an adult. The teenager’s brain is still in the developing stage and drinking can have more harmful effects on a developing brain than a developed brain. Effects of alcohol is different in each stage of brain development (teenage, adolescence and adulthood). Women have lesser dehydrogenase, an enzyme which breaks apart alcohol molecule in the stomach and so women reach higher blood alcohol levels than men despite drinking the same amount of alcohol. Drinking alcohol during the brain’s development phase can even result in permanent damage to brain functions, especially those related to coordination, movement, and memory. A research study says that youngsters who start drinking by 15 years are likely to have alcohol dependency about four times more when compared to adults who start drinking from age of 21. The teens that begin drinking generally do so in their pursuit to look for ways of avoiding life’s problems instead of dealing with them. Long-terms effects of alcohol kicks in with binge drinking and continued usage in large amounts that can result in several health problems. Family problems, and relationship problems. Brain: Alcohol interferes with brain’s communication pathways and can impact the brain’s functioning. These can result in changed mood and behavior and also cloud proper thinking and coordination. Heart: Binge drinking or continuous alcoholic consumption over a long period damages heart and causes complications like cardiomyopathy; cardiac arrhythmia; stroke, and high blood pressure. However, research has suggested that moderate alcohol consumption helps in protecting healthy adults from coronary heart disease. Liver: Liver goes for a toss when drinking goes beyond a person’s control. Drinking takes a toll on the liver and can cause complications like alcoholic hepatitis; chronic hepatitis; steatosis or fatty liver; liver fibrosis and cirrhosis. Pancreas: Alcohol causes pancreas to produce toxic substances which can cause pancreatitis, a dangerous condition which inhibits proper digestion, resulting in severe and often fatal consequences. Immune System: Drinking excessive alcohol can weaken your immune system and make the body a much easier target for any disease. Chronic drinkers are more likely to contract diseases like tuberculosis and pneumonia than people who either abstain or drink in moderation. Drinking more than the body can handle in a single occasion slows body’s ability to ward off infections even 24 hours after being drunk. Besides the above-mentioned, excessive drinking increases risk of developing cancers like oral, esophageal, throat, breast and liver cancers. Several factors determine the time alcohol stays in the blood, saliva and urine. The typical time alcohol lasts in the human body is about an hour or more and sometimes can flow in the bloodstream for several hours. Though alcohol passes through the digestive system, it requires little to no digestion. Once alcohol is consumed, 20% of the substance goes directly into the blood vessels and is carried out throughout the body to the brain. The rest enters bloodstream after being absorbed by small intestines. Once alcohol enters the bloodstream, it goes into the liver to get metabolized. The liver is the organ which metabolizes alcohol. Genetics, environmental, physical and mental health factors control alcohol metabolism and elevates blood alcohol content (BAC). BAC is percent of blood that has concentrated alcohol levels. For example, if a person BAC of .10, it implies 0.1% of his blood is alcohol. Drinking alcohol while there is food in the stomach reduces absorption rate. Eating high proteins before and during drinking can slow absorption of alcohol. Drinking on an empty stomach makes one feel the effect more quickly. Drinks taken on an empty stomach hits peak blood alcohol level between 30 minutes to two hours after consumption, depending on amount consumed. Gender and body weight also matter a lot in metabolizing alcohol, as men and women do it differently at different rates. Women have lesser dehydrogenase, an enzyme which breaks apart alcohol molecule in the stomach. This contributes to women reaching higher blood alcohol levels than men despite drinking the same amount of alcohol. Alcohol consumption affects mood too. Euphoric effect occurs at BAC of 0.02 to 0.05 and once it reaches about 0.07, the drinker’s mood worsens. 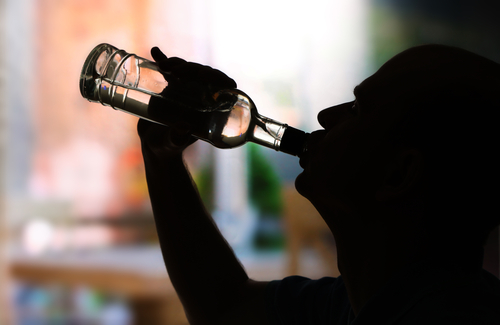 Person battling depression may worsen symptoms with drinking. Stressful emotions cause a change in the stomach’s enzymes which affects how a person breaks down alcohol. However, metabolism is not the only factor which determines how fast alcohol leaves the body, other factors like how fast the alcohol has been taken in, ethnicity, body fat content, how much food has been consumed before, during and after drinking, medications being taken, and fat content of the food consumed all play a vital role in determine how quickly alcohol leaves the body. Age also matters a lot in reaching intoxication. Just like the teenagers are more susceptible to the damage alcohol causes, senior citizens are vulnerable to alcohol because of age-related changes in their bodies. Older people have a decrease in body water, loss of muscle tissue and decreased metabolism and all these affect alcohol absorption. Though a lot has been shared on alcohol consumption, here’s an important thing to keep in mind, especially for pregnant women. Women must be aware that alcohol enters the bloodstream and passes through the placenta and enters the fetus (unborn child). Alcohol damages the fetus at any stage of pregnancy, but more seriously in first few months and risk of alcohol-related birth defects including growth deficiencies, facial abnormalities, brain damage and damage to nervous system increases a lot. Detection of alcohol is possible through urine, saliva, sweat, blood and hair. Urine test can detect alcohol in urine within a time-frame of 2 to 24 hours after having the last drink. Length of time depends on how much alcohol one has consumed. Substance Abuse and Mental Health Services Administration states that a breathalyzer can detect alcohol in the breath for up to 24 hours after drinking. Alcohol is detected in saliva two hours after consumption and a hair test (called ETC test) can detect alcohol for up to 90 days after having consumed alcohol. Alcohol related road accident deaths still account for nearly 30% of all traffic fatalities. 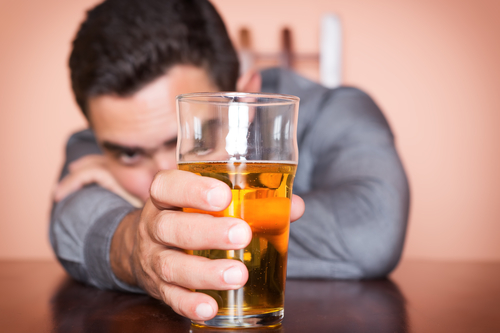 Once alcohol begins to flow in the bloodstream, alcohol leaves the system in two ways – 10% leaves through sweat, urine and breath, while other 90% is metabolized in the body itself, through the liver. 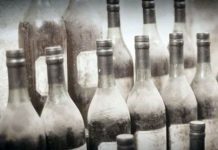 Liver breaks down alcohol into acetaldehyde, a chemical the body knows and recognizes as a toxic substance. Acetaldehyde metabolizes into CO2 which the body can eliminate, though in some cases, acetaldehyde is insufficiently produced leading to some people having flushing symptoms, which causes dizziness, nausea and vomiting. Typically, liver metabolizes alcohol at rate of 0.015 mg/100 ml/hour. If one has had a glass of wine (5 fluid ounces), liver will be able to metabolize it in about one hour. If one has had two shots of vodka, one after the other, it takes two hours to sober up again. When any person starts taking alcohol at a faster pace than liver’s metabolization capacity, the process changes. 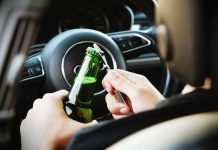 When blood alcohol level rises beyond 0.055, the blood and body tissues start absorbing extra alcohol which starts producing unpleasant effect like depression, disorientation, nausea, vomiting, irritability, and memory loss. So, the count goes like this – from a BAC of 0.08- after 1 hour the BAC would be 0.065, after 2 hours the BAC would be 0.05, another hour later the BAC drops to 0.035, after 4 hours it would be 0.02 and 5 hours later BAC would be 0.005. Once it reaches 0.005, the human body takes 20 minutes to bring the alcohol level to zero, so effectively a person takes nearly 5 hours and 20 minutes to sober up if he has a BAC of 0.068. This calculation makes it simple and easy to determine when the body becomes completely free of alcohol, though it isn’t easy to determine level of BAC without any alcohol level testers like disposable alcohol test kit or a breathalyzer. Previous articleHow long does cocaine stay in your blood, hair or urine?